Anthony Jerome "Spud" Webb (born July 13, 1963) is an American retired professional basketball point guard. Webb, who played in the National Basketball Association (NBA), is known for winning a Slam Dunk Contest despite being one of the shortest players in NBA history. NBA.com lists him at 5 feet 7 inches (170 cm) tall. He is currently the President of Basketball Operations for the Texas Legends, the G-League team for the Dallas Mavericks in Frisco, Texas. Webb was born into poverty in Dallas, Texas. He was raised in a small two-bedroom home and used basketball as an inspiration. Webb was not tall, but he used his quickness and jumping ability to outplay the other, bigger kids. Starting in the seventh grade, Webb was told that he was too short to play basketball. He received a chance to play on his junior high team only after 2 players forgot to complete their physical exam requirements in time for the first game. Webb scored 22 points in that first game. He could dunk the ball when he was 5 feet 3 inches (1.60 m). At Wilmer-Hutchins High School, he played on the junior varsity team where he made a large impact; when he made the varsity team, he averaged 26 points per game. Despite his impressive high school record, colleges showed little interest in Webb. He received his first opportunity to play on a college basketball team when he attended Midland College (in Midland, Texas), where he led the Chaparrals to the junior college national title in 1982. In the championship game, Midland defeated #1-ranked and previously unbeaten Miami-Dade North of Florida, 93 to 88, in double overtime. Webb led all scorers in that game with 36 points, making 10 of 15 shots from the floor and 16 of 18 from the free-throw line. His performance at the tournament earned Webb a write-up in Sports Illustrated, and national attention. In 1983, he was named an NJCAA All-American by the National Junior College Athletic Association. Webb attracted the attention of Tom Abatemarco, an assistant coach at North Carolina State University, who arranged for Webb to meet head coach Jim Valvano, who offered Webb a scholarship. In college, his vertical leap was measured at 42 inches (1.1 m). Most scouts predicted that Webb would end up playing in either Europe or for the Harlem Globetrotters because of his height. However, Webb was drafted in the 4th round of the 1985 NBA draft by the Detroit Pistons. 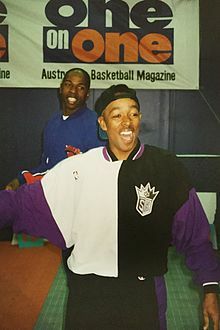 His first six seasons were played with the Atlanta Hawks, but he had his best years statistically with the Sacramento Kings, where he played as a starter from 1992–1995. He then split a season between the Atlanta Hawks and the Minnesota Timberwolves before finishing his career after one season with the Orlando Magic and retiring from professional basketball in 1997. Webb played 814 games in his NBA career, averaging 9.9 points per game, and registering 8,072 points and 4,342 assists in twelve seasons. Since Webb made his NBA debut, only two players have been shorter than he was: Earl Boykins and Muggsy Bogues. Webb was the shortest person to compete in the NBA Slam Dunk Contest, winning the event in 1986 at Dallas' Reunion Arena. His participation surprised the media; including his teammate and defending dunk champion Dominique Wilkins, who had "never seen me dunk before", Webb said. His dunks included the elevator two-handed double pump dunk, the off-the-backboard one-handed jam, a 360-degree helicopter one-handed dunk, a reverse double-pump slam, and finally, the reverse two-handed strawberry jam from a lob bounce off the floor. He defeated Wilkins with two perfect 50-point scores in the final round. Atlanta coach Mike Fratello said, "Spud kind of duped him. He told Wilkins he never had anything prepared, didn't practice for it. So, Wilkins maybe thought his normal assortment would be good enough to get through". Twenty years after Webb's victory in the Slam Dunk contest, he trained New York Knicks point guard Nate Robinson (who stands at 5 feet 9 inches tall) to win the event. Webb tossed the ball to Robinson, who leaped over Webb and dunked, earning 50 points from the judges. Robinson went on to win, making him and Spud the only two people in NBA history under six feet tall to win a slam dunk contest. Webb was a judge for the 2010 Dunk contest in Dallas, at the American Airlines Center. It was the first time the event has been in Dallas since Webb's win in 1986. ^ "NBA Stats – Spud Webb". NBA.com. 2013. Retrieved 2013-03-28. ^ a b c Martin, Buddy (March 20, 1985). "Super Spud". The Denver Post. ^ "This T.O., We Like." Dallas Observer. October 25, 2006. ^ "Spud Webb to judge Slam Dunk Contest as part of NBA All-Star Weekend – ESPN Dallas". Sports.espn.go.com. 2010-02-13. Retrieved 2012-07-17. 2004 interview, "Catching Up with Spud Webb"